Tate Modern is the national gallery of international modern art. 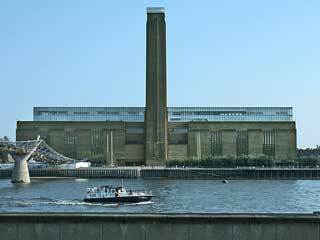 Located in London, it is one of the family of four Tate galleries which display selections from the Tate Collection. The Collection comprises the national collection of British art from the year 1500 to the present day, and of international modern art. Tate Modern is located on the south bank of the River Thames at Bankside, near Blackfriars Bridge, opposite St Paul’s Cathedral and next to the Globe Theatre. Tate Modern is ten minutes walk from the tube stations at Southwark (Jubilee Line) and Mansion House (District and Circle Line) and 15 minutes from St Pauls (Central Line) . A number of buses run nearby including RV1 which runs between the Tower of London, Tate Modern and Covent Garden. Thameslink links between Bedford and Brighton stop at Blackfriars and London Bridge stations.